The S.O. and I were walking through a section of town called "Little India" and came across the movie poster you see here. The movie is called Ra.One and came out late in 2011. It's about a dad who's trying to connect with his son and develops an incredible video game based on his son's ideas, but the video game characters break into the real world. (At least, that's what I can tell from the somewhat enigmatic trailers and descriptions I've found so far.) The protagonist is played by Shah Rukh Khan, sometimes called the "King of Bollywood." The movie was allegedly the most expensive Bollywood film ever with a budget of $23.75 million US. While apparently not a complete critical success, it grossed $45.6 million worldwide. It was initially released in 3,100 screens in India and another 904 around the world, and had the biggest ever opening weekend in India. The marketing campaign last nine months. Related toy products included character sculptures, action figures, video games, and a wearable "H.A.R.T." (not dissimilar to the arc reactor from the Iron Man movies). The official website includes an online comic prequel to the movie. All in all, a pretty similar treatment to, say, any of the recent spate of superhero movies that have come out of Hollywood the past several years. And yet, here in the States? Almost nothing about it. Granted, Ra.One was originally in Hindi and was only dubbed into Tamil and Telugu, but how many Japanese movies came over to the US with only subtitles to enjoy some reknown? And wasn't The Girl With the Dragon Tattoo a decent hit in the original Swedish before it got remade here? 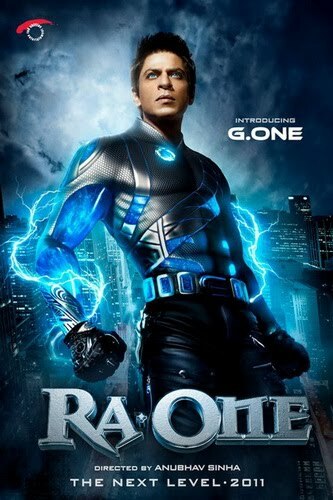 I'm left wondering why IPs like Ra.One get so little attention? There are a lot of Bollywood movies, certainly, that don't get attention because they don't have any marketing budget. But this had a huge campaign behind it. I have to assume that Hollywood distributors didn't feel they could market it to Americans. And I have to assume that's in large part because the people who are Hollywood distributors are white men. They didn't recognize themselves anywhere in Ra.One so why would anyone else be interested? It sounds like George Lucas would heartily agree with your conclusion, moreover.